Read this blog for a nightly recap of Fire in the Triad posts to stay in the loop. You can also follow me on twitter @niksnacks and the hashtag #CompDiningNC for live updates during each battle (dinner begins at 7pm). 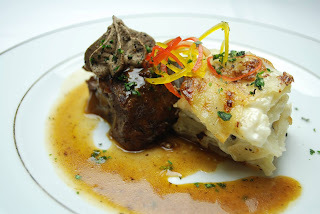 Please also "like" Competition Dining on Facebook and on the web. It was a star-studded night full of local culinary celebrities and special guests. There were a lot of faces in the place: Practically most of the upper branches of the Pate Dawson family tree were in attendance along with guest judges David Bailey of O.Henry magazine, Jeffrey Turner of Our State magazine and Eric Kirkeeng, executive chef of Bermuda Country Club. The last time I saw Eric, I talked about coming full circle and that circle has come back around again! Many moons ago, I did a stage [pronounced STAHJ] and worked alongside Chef Mack Parker at New Town Bistro, here in Winston-Salem. Also, just as many moons ago, I worked with Chef Mark Grohman's pastry chef at Noble's Grille. Six degrees of separation? When it comes to the culinary world, it's ONE degree. And it's time to talk about dinner. What's the featured ingredient? What's for dinner? Beef! Certified Angus Beef, it's what's for dinner! The chefs were given top blade (also known as flat iron steak) and boneless chuck flap (kind of near the short ribs, but not really [I'm a cook, not a butcher, please don't judge me]) to use for our dining pleasure. My favorite course of the night. For the first time in my history of Fire in the Triad, I gave each category all 5s. Not only did it look good, it smelled good. The aioli [essentially a mayonnaise made with garlic] was creamy, tart, tangy and the pink peppercorns gave way to brightness and acidity making this dish the perfect trifecta. It's a rarity to have carpaccio this beautiful for dinner. Thin enough to be used as a pane of stained glass, I thought it too pretty to eat. The beautiful petal of beef, so fresh, red and truly a labor of love. Have you ever pounded out a cutlet of beef? That aioli was definitely the elbow grease on top of this plate. The cracked black peppercorns added spice, texture and paired perfectly with the tangy, yet sweet shallot salad. I wanted to try the beets, but I just couldn't. A small part of me wanted to taste one, but my server took away my plate before I had a second thought about it. My only real complaint about course 2: There was not enough dressing on the greens. I longed for my plate to look like the beauty shot above but I had a remedy for what ailed me: salt. Salt drew the tiniest bit of moisture out of the lettuce leaves so I could eat them without choking. I also had to salt my tomatoes to extract every bit of flavor from them, since it's not quite peak time for this member of the nightshade family. The yellow were more flavorful than the red, but I'm sure if there was more dressing, that problem would have been addressed. The grilled crimini mushrooms [also known as baby portobellas] matched the blackened blade steak batons with piney notes that were a little too bitter to withstand the rest of the dish without the promise of more sweet berry dressing. I did not get a radish on my plate and I'm glad I didn't. Diners at my table did not care for the little root vegetable and told me I was fortunate to not have to taste this noxious nubbin. The most complex dish of the night, six flavor dimensions were hit here. Every taste from sweet to umami was in this dish. THIS was cooked with some soul, man [cue up Sam & Dave]. The ragout was a pile of braised beef similar to pulled pork (in texture), hanging out in a beautiful, beefy broth. The grilled oyster mushrooms were multidemensional, SO smoky, so flavorful and I wished I had more than two. The sweet potato pierogi was nothing like the frozen ones from the Mrs. T. box. Accented by the sweet, roasted cippolini onions, I took a piece of bread to sop up all of its savory goodness of my plate. The highest scoring dish of the night, it was the most visually familiar and tastiest course of the evening. Sorry, it's not pretty, but I needed you to see this ragout. I will promise you this: I was not biased against this dish because of the presence of the golden beet gaufrette, but I was biased against this dish based on the quinoa. The quinoa was the worst part of this dish. There was more of it than steak and I was not happy about that. I couldn't find any cherries, flavor or reason to eat past the first forkful. It was like having a mouthful of spindly, warm beads. The bok choy was greasy, hard to cut and hard to eat. The steak was good, swimming in the sweet ginger demi, but steak does not a whole course make. I was glad to move on to the next course. My second favorite of the night, I almost ate the plate of the guy sitting next to me because he took too long in the restroom. Not the prettiest plate of the bunch, it looked to be something mediocre at best, but it was deep, rich and intense. The chuck flap was hot and layered with flavor. The musky, earthy, nutty undertones of the coriander were tamed by the red wine sauce and I ate it slow to savor every bite. I wanted to taste the familiar tang of the bleu cheese in the gratin [there was none], but it was creamy, which is just how I like it. The black garlic and truffle butter had melted by the time it got to me at the table, but I didn't care. It washed over the potato pieces on my plate and gave my bread something to soak up before the last course. The most unique use of Certified Angus Beef of the night, this dish goes down in the books as "most undetectable featured ingredient." Bread pudding is usually hot, creamy, and soaked in custard. This bread pudding was not. It was cold, crouton-like bits of bread coated in melted chocolate couveture pressed into the ramekin. I mistook the crusty bits of beef jerky-like pieces imbedded in the chocolate pot for pieces of almonds. Speaking of almonds, I received a piece of brittle sans almonds which I was excited about until I tasted it. Reminiscent of burnt caramel and strong coffee, it would have made for good penny candy for someone with sensory deprivation issues. When the scores were being tallied and displayed for all to see, it was soon apparant that Chef Mark Grohman and his team were the winners of battle Certified Angus Beef. 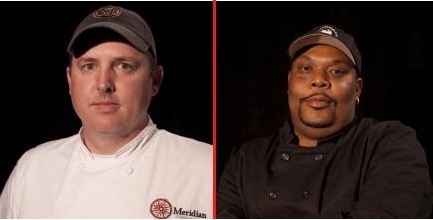 It's good to know we now have TWO Winston-Salem chefs in the running for Fire in the Triad semifinals. 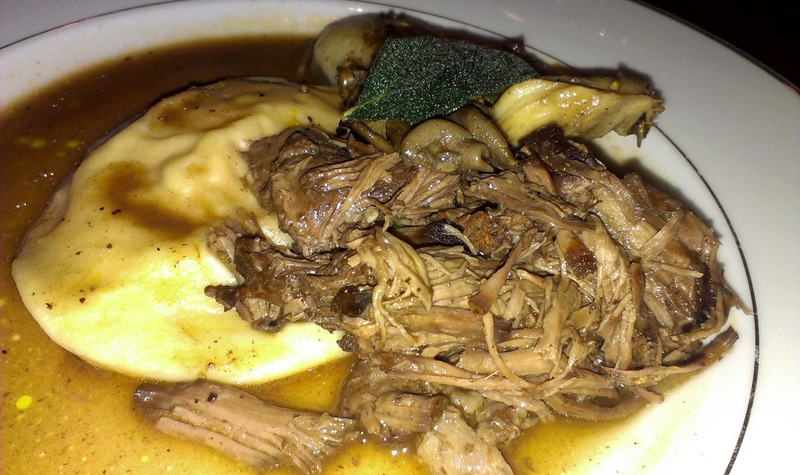 Will Chef Travis Myers of River Birch Lodge made it a trio? On May 29, we'll find out! For a complete breakdown of the night's scores, dishes, and additional photos, please visit Competition Dining. Stay tuned tomorrow to read about the winner of tonight's battle between Chef Timothy Bocholis of Bistro B in Kernersville and Chef Chris Russell of B. Christopher's in Burlington. The B's definitely have it! You should've tried the beet. So sweet almost like a sweet pickle. Not at all beet-y. Loved that dish. Dish 5 was my favorite. See ya tonight! How can you can give a plate the highest score when you are too immature to even try everything on it? You've discredited yourself as a food reviewer. Thank you for your comment, Anonymous. You're too immature to put your real name. You've just discredited yourself as a commenter. I'm not a hater. In fact, I've actually enjoyed your blog about this year's competition. However, I find it disconcerting that the official blogger of this competition refuses to partake of certain ingredients utilized in the chefs creations. One of them may actually prepare beets in a manner that you like. You'll never know until you try it. As for immaturity, your resort to vulgar name calling on FB proves my point. I hate beets. The end.